At Houston Granite and Flooring, our goal is to provide our clients with unsurpassed quality, craftsmanship, and customer service. 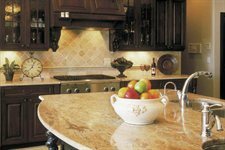 We specialize in the custom fabrication and installation of ALL types of Natural Stone Countertops as well as Corian and Quartz. We also install all types of Flooring such as Tile, Hardwood, Laminate, VCT, Vinyl Plank, Carpet, and other architectural flooring services for any Commercial or Residential application. We Specialize in Flooring Restoration from Tile, Hardwoods, Engineered, Natural Stone, an many other surfaces. Houston Granite and Flooring can restore your floors to look as good as they did when they were brand new. We clean, regrout, seal, polish, enhance, and remedy all flooring. Whether its a home upgrade, remodeling, or restoring from old to new we can help you. Houston Granite and Flooring walks you the through the process of selection in preparation for installation. We are Insured, Bonded, and implement Workers Compensation benefits on all of our jobs. Call for a free Consultation with Estimate and let Houston Granite and Flooring take care of your Countertop and Flooring Needs.